Get Happy Week 6: Dark to Light – Ready. Aim. Grow. Getting Happy isn’t focusing on the good stuff or “seeing the bright side.” While that helps, it’s important to get to the deepest part of our core, which means embracing pain and darkness as a foundation for true inner happiness. In my Solo Camping post, I talked about the book Learning to Walk in the Dark in which Barbara Brown Taylor not only describes our fear of physical darkness, but of the “dark nights of our soul.” She discusses how we might get the most out of embracing our dark paths, not repressing them or simply “praying them away.” We have to Get Real about our darkness to deal with it. Obviously one way I deal with my own demons is by writing stories, which feels like “letting the pressure out of the tire” but it has also slowly removed many thorns in my life. 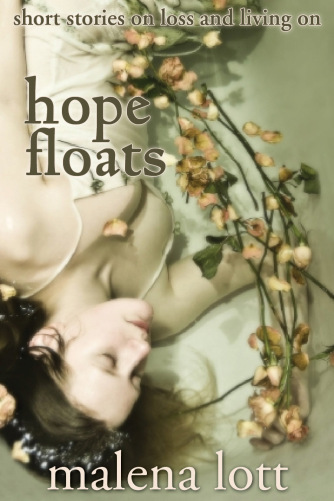 As I write about love and loss and grief as a recurring theme in all of my stories, I’ve been able to deal with my own Dark Passenger, Grief, which I also wrote about in Hope Floats, short stories on loss and living on. While I’ve dealt with letting go of worry and anxiety that stemmed from a childhood thorn of a fear of abandonment, I hadn’t really dealt with the big thorn of Grief. As I’ve been excavating mySelf this year, I realized it was time to let that go, too. In my 2008 novel, Dating da Vinci, my young widow Ramona, describes life from the viewpoint of either a Normal or a Griever. When you’re a Griever, everything looks different – it’s tinged with a sadness of what was and what could have been and the very painful reality of what is. Her journey is to find la dolce vita, the sweet life. Not the same life she had with her husband, but a new kind of normal. While I had accepted that I do look at life as a Griever and it’s made me appreciate each day I’m given, I do think I had an attachment to that aspect of my life story and I’m ready to REMOVE THE THORN instead of protecting it. Wow. I know I don’t want that. Do you? I want joy and freedom and utilizing my energy for moving forward, not protecting my pain. In dealing with our darkness, Singer says, “Just sit in the seat of awareness and never leave. No matter what goes on below you, open your heart and let it go.” He speaks of a world of pure energy that will open up to you as a result and who doesn’t want that? One of my new favorite mantras came from his book and that’s, “Relax and Release.” When I feel the pang of worry, anxiety, fear or grief begin to stir, I stop the thought short and take in a deep breath and release it. No, that doesn’t guarantee “insta-happiness” but that’s what this series is all about. Happiness WHILE dealing with what is even when that what is is totally crappy. Another find that helped me deal with Darkness this summer was a program by Frederick Buechner, who had experienced a great deal of pain early in his life and discovered that he was a Steward of Pain. I encourage you to read or listen to it. Like Taylor, Buechner tells us NOT to forget it, cover it up, or not talk about things that cause pain OR use it as a sob story or an excuse for your life. We can take the pain and learn from it and release it but keep in touch with it. You’ll never forget it because it changed you but it doesn’t have to keep you down. He says it reminds us of our own powerlessness and that’s a good thing to know. Coupled with Singer’s advice to release your mind of a job to “fix yourself” then we won’t make ourselves crazy trying to control what is OUT of our control. One way to do this is to be an observer of your life. You see that these things are happening to you – but they aren’t you. It can help to grasp that concept with a meditation program where you do sit and see thoughts and feelings pop up but you don’t get distracted by them. To rise above. Buechner says, “if life and pain is buried, you shrink instead of grow, you become less. Ones who traded with their lives made to be life traders. I have what you need which is me and you have which I need, which is you.” Treasure the pain you’ve gone through helps us feel compassion for other people and can drive us to help others. I know just thinking about the thorn(s) can be painful and opens us up to that uncomfortable vulnerability to look at love and loss square in the eye, raw and aching. But no one else is going to do it for us. It’s work but it’s worth it. Loving ourselves and loving others is what life is all about. Grace is ours if we take it. Questions to ponder: what are the thorns in your life? How have you been protecting the thorns instead of dealing with them? What steps do you need to do to remove them? Thanks for being a part of my “Get” year with Get Real, Get Out, Get Fit and Get Happy. I’m taking a blog hiatus so I can work on my novel in progress as well as some short stories in a collection I’m excited about. All of that on top of decorating and branding work and a personal life with a very busy fall. If you miss me, send me a note or seek me out on social media, where I’ll try not to hang out too much but I do try to respond to messages. Best of luck on your journey, friends.